Shopping for last minute gifts can be an arduous process. Shoppers can often feel a sense of hopelessness as they hurriedly search for suitable gifts. Plus, seeing more proactive friends and family finished with their holiday shopping can make them feel like a failure. Last minute shoppers in the audience – take heart – you’re not alone. A recent study found that 40% of consumers wait until the last minute to find gifts for friends and family. What does this mean for e-commerce? 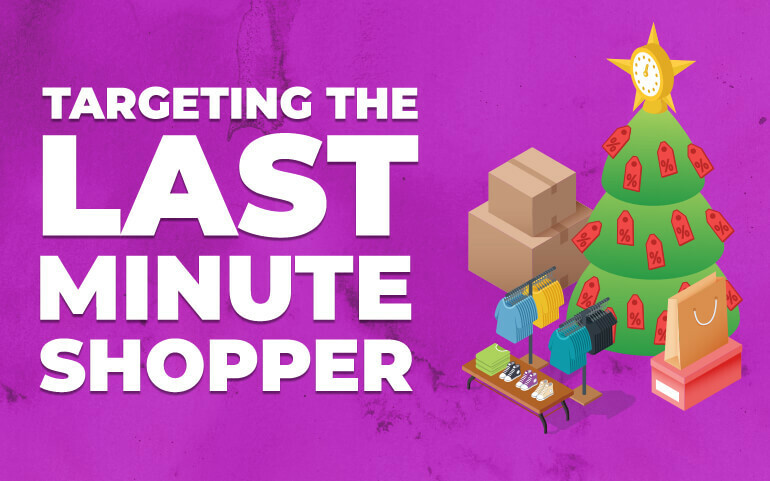 Last minute shoppers are a huge market. However, when it comes to eleventh hour gift buying, many consumers turn to brick and mortar stores. Shopping in person means instant gratification, allowing consumer to check something off their mental to-do list. So how can e-commerce capture a larger piece of this valuable segment? Gift cards, known in former times as “gift certificates” once had a less-than-stellar reputation. Until 2009, individual stores were allowed to set extremely limiting expiration dates on gift certificates, sometimes as short as a month. Today, federal law stipulates that gift cards must remain valid for at least five years after the purchase date; the reputation of gift cards has increased rapidly. In fact, research shows that gift cards are one of the most popularly requested gifts in the U.S., and have been for over a decade. The reasons are obvious: they’re quick to buy, inherently useful, and allow the receiver to choose his own gift, while also demonstrating some level of thought on the giver’s end. Another huge benefit of e-gift card is that they can be bought and transferred instantly via email. This means that consumers can buy gifts at the literal last minute and still have a present ready on time. Email remarketing can be highly effective at promoting such purchases, especially as the holidays get closer. Messaging emphasizing urgency, complementing the pre-existing urgency felt by the shopper, is an excellent way to spur a them to action. By emphasizing the instantaneous nature of the gift, it’s easy to convince last minute shoppers to buy without having to leave their couch. Another great way to engage last minute shoppers is through discounted/free/upgraded shipping. Many last-minute shoppers are wary of buying online because they worry about the cost or reliability of shipping. This is the point at which many consumers turn to brick and mortar stores. That being said, many shoppers also realize that it would be faster and easier to shop online. Thus, removing the main barrier, that of shipping, can be a fantastic boost for last minute shoppers. As is often the case in e-commerce, the best solution benefits everyone – you capture a new market, the customer saves time and money. Everyone wins. Although it can be very difficult to know what someone will like, the truth is, many of us are more similar than we think. Although the concept of giving every person on your list an extremely thoughtful gift is idealized in our culture, this isn’t always practical or necessary. Creating a section for well-priced last minute gifts is an excellent way to quickly convert shoppers, while saving them time. The keyword to remember when picking out items for this type of section is “understated.” While bold styles can certainly be a good thing, bets are unlikely to be hedged on quirky graphic t-shirts with off-color slogans. By creating a section dedicated to last-minute shoppers, those who’ve waited won’t have to scour your site in search of suitable gifts, and can instead quickly and easily finish their holiday shopping for that hard-to-buy-for person on their list. Last minute shoppers are often stressed and under pressure. They also make up a large portion of gift-buyers. By catering to their unique needs, e-commerce companies can continue to ride the Cyber Monday wave all the way to the end of the season.